Sorry. That was a lie. Let me start over. At any given moment, there’s a 65% chance I’m thinking about outer space. 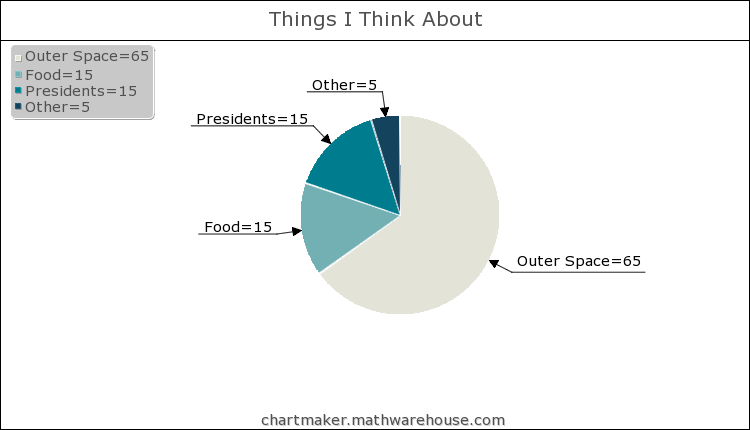 Sometimes I think about presidents and food, too, but space takes up the most… well, space, I guess. I drew you a diagram. My bedroom is space-themed because I’m secretly a 10-year-old boy. My first science fair project was on space. My favorite movies and television shows are about space. I can’t get enough of space, which is ironic because it’s literally the most abundant thing in the universe. If it weren’t for Teddy Roosevelt or meatballs, I would never stop thinking about it. The only problem is that thinking about space makes me really sad. It usually happens late at night when I should be sleeping. Realization#1: I’m not good at math or physics. Because I like space, I’m always trying to read about it. “Trying” is the operative word, because I’m not smart enough to do it. Reading about space quickly devolves into looking at pictures of space and saying “WOW!” over and over again until my neighbor pounds on the wall. At that point, I decide that the only way for me to really understand space is to go there myself. Immersion is the best way to learn a new language. That should apply to physics, right? Realization #2: I live in a country that can go to outer space but chooses not to. It blows my mind that we’ve developed the technology and we have this final frontier waiting and we’re just… not doing anything. It’s like being a caveman who knows how to make fire but would rather wear a lot of mammoth-hide layers instead. If I wanted to go to space, I’d have to go with a private company. Of course, no private company would take me because I don’t have a) any useful space skills like a science degree or piloting experience or b) a gazillion dollars. However, if you represent a space-exploring company and you need an astronaut who knows her way around Twitter, LOOK NO FURTHER. Realization #3: Even if I did manage to get to space, it’s not like I could really explore it. Space is so big that a manned trip to Mars isn’t possible because there’s no way to keep enough supplies on the shuttle for the whole trip. Mars is the closest planet. It would take 23 years to get to The Celestial Body Formerly Known as Planet Pluto. Realization #4: Time is my worst enemy. It’s hard not to think about time when you’re thinking about space, because their incredibly closely intertwined. This guy knows what I’m sayin’. Thinking about time always results in a tiny existential crisis for me, and space just makes it worse. Space is so big that I don’t even qualify as a speck. I’m not even a speck in the eye of a speck that’s on a slightly bigger speck, orbiting another speck. If everything goes according to plan, I have about 61 more years of life ahead of me. Even if we had to ability to send manned flights into space, that’s not enough time for the speck of a speck of a speck to explore the universe. That’s not even enough time to get to the end of the solar system. I’m going to die in a tiny corner of space without ever seeing any of it. Realization #5: Forget about me– no one is ever going to see the universe. Unless the human race invents an impossibly brilliant mode of transportation (preferably one that’s bigger on the inside), there’s no way they’ll even leave the galaxy. Space is so, so, so big, and our tiny speck lives are so, so, so short. Realization #6: We’re pretty interesting, for a bunch of inconsequential specks of nothing. Parts of me came from Shakespeare! And Genghis Khan! And Andrew Jackson! They may have been specks, but they were impressive specks. I can’t explore space. I’ll probably never even get there. We’ll never be more than specks, but we can be awesome specks. If we were anything less, we’d be betraying our atoms. Realization #7: You know what the best part about atoms is? They come from… oh. Oh my stars. Guess I can scratch “go to space” off the ol’ bucket list. I love the way you came round to that conclusion … clever stardust girl! There has been more technological improvement in the last 50 years than in the previous 5,000. So if we use scary weird Maths to figure out what that means if it keeps advancing at that rate, not only should you be able to go to space, you should be able to like, BE space. Or something. I don’t know, but it’s a cool thought. if you need help with Maths like I do, might I suggest “Look Around You’s” tutorial. https://vimeo.com/13497928 (This is only the best show ever made, and if you haven’t seen it yet, you are going to be so freaking happy I introduced you to it.) Happy existential crises-ing! Please tell me that’s not true. PLEASE. One of my goals is to re-teach myself higher math as well as some physics. I love both and am fortunately good at those things. Have you ever checked out http://www.thegreatcourses.com? They have loads of educational CDs, DVDs, and downloads of many subjects on life, the universe and everything. I love them because many of them are more like Nova programs than “educational” per se. Even Neil Degrasse Tyson has one in there called The Inexplicable Universe: Unsolved Mysteries. It is on my wish list. 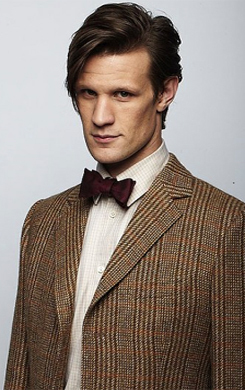 Have you heard that Matt Smith is leaving after the christmas special this year? There are hints that the 12th Doctor might be a woman but I’d be very surprised at that. All this did for me was make me sad that in all probability, any crazy man I meet will not have a blue box I’d want to hop into. Have you read Packing for Mars? It’s the best, funniest space book I’ve read lately.